B&R now offers its Power Panel operator panels for swing arm mounting. The compact terminals feature all-round IP67 protection and are perfectly suited for use right at the machine. The devices are available in widescreen format in five sizes from 5.0″ to 21.5″. 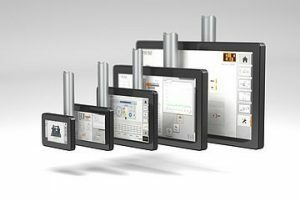 With an embedded browser, Power Panel T50 Field HMI terminals are well-suited for displaying web-based HMI applications with mapp View. The devices are either 16.5 or 26 mm deep, depending on the display diagonal, and designed for mounting on a swing arm, where they can be easily swiveled into the operator’s preferred position. The Power Panels can also be installed on VESA mounting units. The FT50 terminals have a Power over Ethernet (PoE) connection, which means only a single cable provides both power supply and network communication.